ABBY: We should all get together and go to the movie as a group. Kind of a team building thing. NADIA: We have a bit of an activity fund, we should be able to cover a night at the movies for everyone. ABBY: Great. Let’s go this Friday. 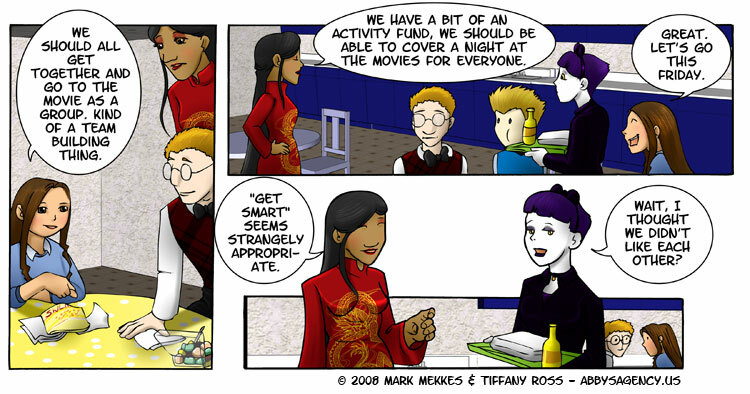 NADIA: “Get Smart” seems strangely appropriate. PLAGUE: Wait, I thought we didn’t like each other?